Ladies and Gents ... this may come as a shock to some: bloggers are no longer people who sit at home on their computers with a bucket of Cheese Puffs and a silo of Coke - going on ... and on ... and on ... and on, ad nauseam, about their topic du jour. Although be warned, those kinds of overly verbose and exhausting to read blogs are still around and you don't have to travel too far to find them. Anymore, bloggers are the folks in-the-know. They are often the ones that companies rely on to structure their message, to release news quickly and efficiently ... all to a wider audience. Some might say that bloggers are quickly becoming the 21st Century version of the "roving reporter" because they can electronically gain access to contacts, ask pointed and controversial questions, and report on what they've found - in a most likely anonymous, sardonic and entertaining way. So, imagine my lack of surprise when I noticed that a reporter who recently wrote a story about James Levine's health for Macleans.ca quoted two separate bloggers as sources for the article. Both Opera Chic and Parterre Box were quoted and most certainly helped to structure the overall message of the article. Anonymous. Somewhat sardonic. Entertaining. What more could a reporter ask for in a source? 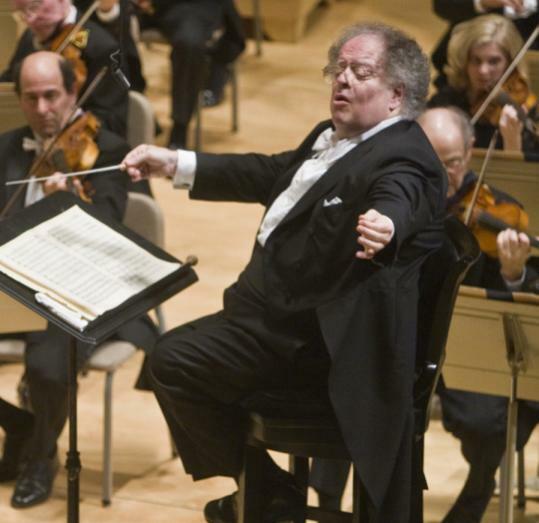 It is apparent to all of us that James Levine's health problems are most definitely effecting his ability to work. Arguably the most visible of American conductors, Levine - who is 67 - is musical director of the Metropolitan Opera and the Boston Symphony Orchestra. He shuttles back and forth between the cities within a schedule that would make most people collapse. As Maestro Levine has gotten older and as his health began to decline, his cancellation record has become longer than one of his epic Met Galas. Not only has the notoriously rotund Maestro had continual back problems resulting in surgical intervention, but other health problems, including a kidney tumour, have caused Levine to miss performances in the past. ...For now, though, Levine seems to be proceeding as if there’s no threat to his job. Though Eichler says “I don’t think anyone feels the status quo from last season can be maintained,” Levine’s schedule is over-stuffed: the opera blog Parterre pointed out that on Oct. 9, he is scheduled to conduct a Ring matinee for a live high-definition simulcast, then fly back to Boston to conduct a massive Mahler symphony that night. It seems that Levine, or his management, hasn’t yet started to worry about spreading himself too thin—so to speak. I hate to say it, but it may be time for Maestro Levine to take it down a notch. I'm sure I speak for many when I say that I'd like to see him continue to conduct quality performances that may be less in number rather than continue to over work himself to the point of continued physical detriment. Anyway - as per usual - I continue to wish James Levine all the best and hope for a successful return to the podium. Additionally, I continue to look with gratitude toward Opera Chic and Parterre Box. They are the Tribal Elders for all of us who blog about opera and the like. One of the educated posters on the ever-educated Parterre recently gave Levine one year to live. Many others on both Parterre, OC and elsewhere post similar kinds of stuff that just smacks of hopeless, bitter, jaded hermits sitting at home on their computers with a bucket of Cheese Puffs. Hopefully, in your somewhat salivatory tribute to Parterre and OC, you are taking their habitual posters with a grain of salt. Oh, don't you worry... a grain of salt is definitely had when pouring through "comments" left by faithful readers of Parterre and OC. Some of the comments are spot on, but many are just plain laughable! When the BSO chose Levine, Michael Tilson Thomas was available. Andre Previn was available. The European reviews of Levine's concerts in Europe are mediocre at best. Just Google those concerts. Reviews say the orchestra plays better. Well, the orchestra is where a lot of major orchestra's are.... the baby boomer chairs are being replaced with younger and better generation players. Hey, that's the same for all orchestras. He's should swallow his pride and retire or go to part time. He health is laughable. Plus who doesn't think the substitute conductors have been better as a whole. It is time for the ghost of Koussevitzky past to arrive and the ghost haunts the BSO and it ain't Levine.